Now that the Russian IADS in Syria is deployed and presumably fully functional, it changes the regional security situation in two ways. First, it confirms that the ongoing Russian deployment of disparate missile systems to Syria over the past year always intended to culminate in a fully functional IADS, rather than individual missile systems in different locations. SAM systems in the S-300 family (including the S-400) are designed to be both forwards and backwards compatible, which means that their component parts – command and control modules, search and fire control radars, missile launchers and missiles – may be used in different combinations. Second, this deployable and road mobile IADS solely aims to threaten US and coalition aircraft and deter further involvement or escalation of coalition operations. There is no credible fixed wing, rotary wing, or ballistic missile threat to Russian forces in Syria from ISIS or any other potential adversary that would require a modern IADS. 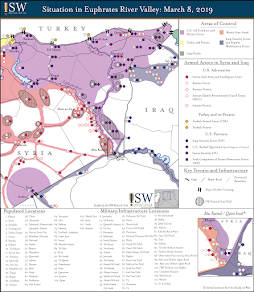 The only purpose of this IADS is to pressure US and coalition policy makers to cede the majority of Syrian airspace to Russian and Syrian aircraft in order to continue their campaign of targeting civilian populations for destruction or depopulation, as evidenced by recent Russian threats to shoot down U.S. coalition aircraft. This expeditionary, modular, and mobile Russian IADS is a significant upgrade over the legacy Syrian IADS. The component parts of the Syrian IADS were largely fixed, difficult if not impossible to move, and highly dependent on centralized command and control as well as external long range radar cuing. The interdependency of the legacy Syrian IADS meant that destroying any one component of the Syrian IADS would significantly reduce its efficacy. In contrast, the Russian expeditionary IADS is fully road mobile, with partial offroad capability, and modular, meaning each component can operate as a standalone SAM system or be organized as a genuine IADS, which is what Russia has now achieved. The Russian expeditionary IADS is much more survivable than the legacy Syrian IADS. U.S. officials, including presidential candidate Hilary Clinton, have suggested establishing a no-fly zone in parts of northern Syria. This would mean using U.S. aircraft to patrol Syrian airspace in order to prevent Russian and Syrian planes from carrying out strikes. Russian expansion of its IADS network means that U.S. coalition aircraft risk being shot down while operating within Russia’s A2AD envelope. A shoot-down of a U.S. coalition aircraft would force the U.S. to either drastically escalate in order to answer Russia’s provocation, or to downscale or cease operations in Syria. 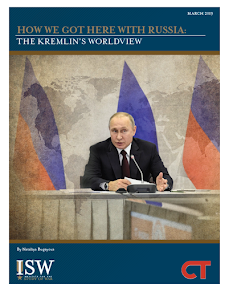 Russia aims to present the U.S. with these two undesirable options on the assumption that the U.S. would choose to avoid any potential conflict. By establishing this expeditionary IADS in Syria, Russia aims to establish a de facto no-fly zone for US and coalition aircraft over much of Syria. 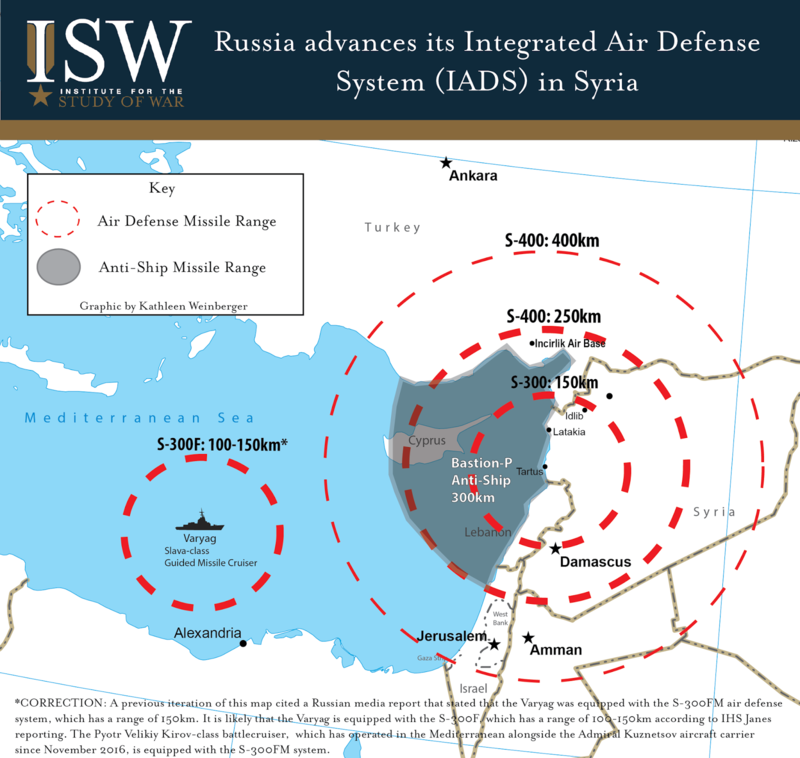 *CORRECTION: A previous iteration of this map cited a Russian media report that stated that the Varyag was equipped with the S-300FM air defense system, which has a range of 150km. It is likely that the Varyag is equipped with the S-300F, which has a range of 100-150km according to IHS Janes reporting. The Pyotr Velikiy Kirov-class battlecruiser, which has operated in the Mediterranean alongside the Admiral Kuznetsov aircraft carrier since November 2016, is equipped with the S-300FM system.